Is there fabric in your bag for me? Hopefully! Did I tell the story of how the last time I ordered fabric I sent it to the wrong apartment? So I typed the wrong apartment numbers and didn't realize it. If I lived in apartment M-67 (which I don't), I ended up sending it to apartment M-78 on the floor above me. Oops. And I missed UPS calling me because I didn't want to answer the phone while I was driving home and because it was a number I didn't know. They were in the parking lot when I got home that day and I saw them drive away as I walked up to my apartment and then I proceded to text the UPS man about how I put the wrong apartment on the shipping address. Oops. Needless to say, I double checked the address when I put this order in. Let's all profess our love for $3.95 yards! I bought all half yards of these fabrics to mix in with some of my current projects including my New York Beauty project, my blue and purple blocks from my swap, and my argyle quilt. I started a project that I have been anticipating for almost two years. I collected Kitty Yoshida's City Girl in coral and took a while before I found the Tula Pink Honey Honey pattern and knew it was perfect. The whole pile has been sitting on my shelf since I moved to PA in an effort to finish my WIPs. But as usual, I forget to take pictures of every step. Drat. Here's one picture of in progress from making the patch diamonds and putting the first border on them. The pattern calls for 39 blocks, but I plan to use up as much of the fabric as I can and keep making blocks. I have 41 blocks made so far, and have center strip sets ready for 14 more blocks. I've been doing the math trying to figure out how many blocks I will need for a bigger quilt. I do have fabric reserved for a border and for a backing, but I might have to piece a back if this thing ends up as big as I think it might. Well, no actual rebels were conquered this weekend, but I did finish putting together the top of Park Ranger Boyfriend's Civil War Quilt. The blue sashing and border fabrics are all from Barbara Brackman's 1862 Battle Hymn line, and the cream and red floral sprig print on the inner border is from an older Civil War collection not by Barbara Brackman that I temporarily borrowed from my mom's stash. So now this baby needs quilted and bound. I am very inclined to hand quilt it but let's remember that my first quilt still isn't finished 8 years later because the hand quilting isn't done. But I really like (love) Park Ranger Boyfriend, so we might do it anyways. He very nicely asked if it would be done by the time he is done working at the park for the season and back at home working on a book for the winter. I can totally picture him reading history books over the winter with this thing. Have you ever undertaken a time-consuming/difficult project for someone you love??? 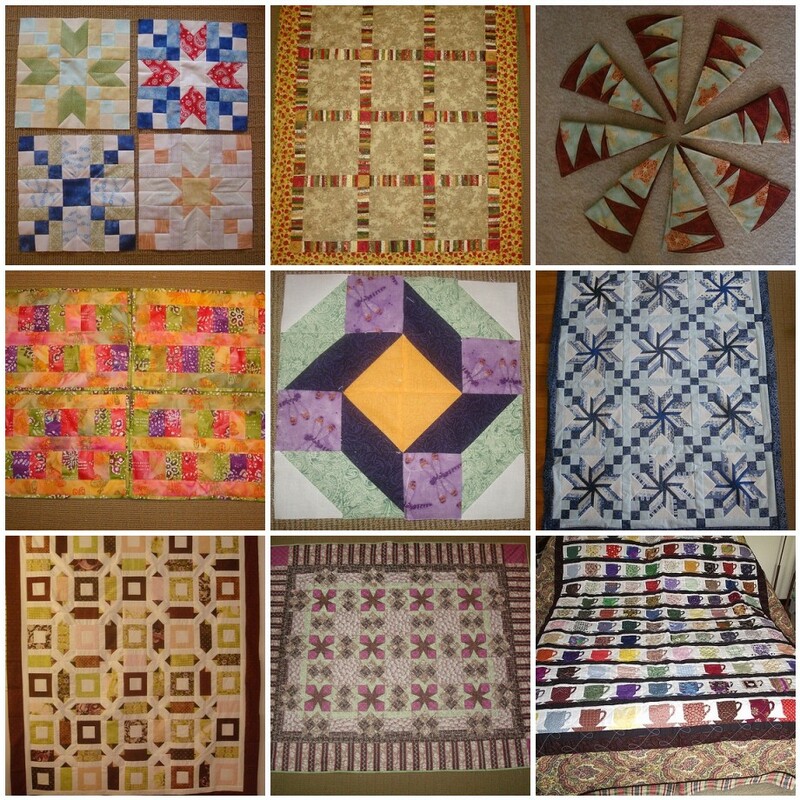 I've been working on putting together my Civil War quilt blocks into rows now that I have my sashing fabric (again!). As of last night I had gotten four rows done...four rows to go! And I had to have a laugh about it. Over the weekend, I got the yard of fabric that I needed to finish the sashings for Park Ranger Boyfriend's Civil War quilt. Last night I sewed all of the sashing pieces onto the blocks except for the the left edge. Tonight I'm going to start working on the last part of the sashing and sewing things into rows. I also took MAJOR advantage of the $3.95 cotton sale at Fabric.com and ordered some more peaches, brown, and teal to match the colors in my New York Beauty blocks. And some other things too, of course. What are your WIPs today? In my frustration of not being able to work on my Civil War Quilt for Park Ranger Boyfriend, I started a new project and continued working on an old one. I continued working on my scrappy baskets, as I found some more white on white prints in my stash. Hooray! I started working on some New York Beauty blocks in using some other scraps and some small cuts of fabric in my stash. Happy Friday! I am off to visit Park Ranger Boyfriend this weekend but I wanted to show off my August Nubees blocks! 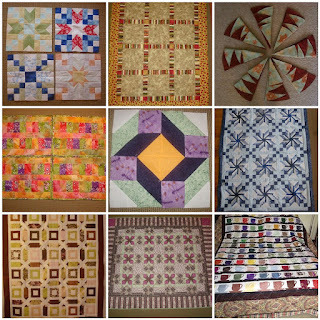 And if you're not too busy go vote for your favorite scrappy quilts in this week's Quilting Gallery contest! My Teacup Quilt is in the running this week! To those of you visiting from Plum and June's Let's Get Aquainted Blog Hop, welcome! I started Little Bunny Quilts a year ago to share my quilting progress and ideas. I've had a needle and thread in my hand since I was 6 or 7, started quilting in high school, and have gotten full force into sewing and quilting since the start of 2011. Did I mention that I'm also a full-time PhD candidate in chemistry? I'm kind of a busy girl. Favorite Quilting Tip: Iron, iron, iron! And do the math before you start cutting. Favorite Blogging Tip: Be yourself! If a quilting blog makes me laugh, I automatically follow it. Favorite Books: Harry Potter series and classic literature. Favorite Quilting Tool: My rotary cutter, it was the best use of Christmas money ever. Favorite TV show while quilting: I usually have Netflix playing on my laptop. I watch all kinds of movies and shows, but I love Parks and Recreation. Binding: Hand or machine? I've never actually done machine binding. I really love hand stitching bindings. 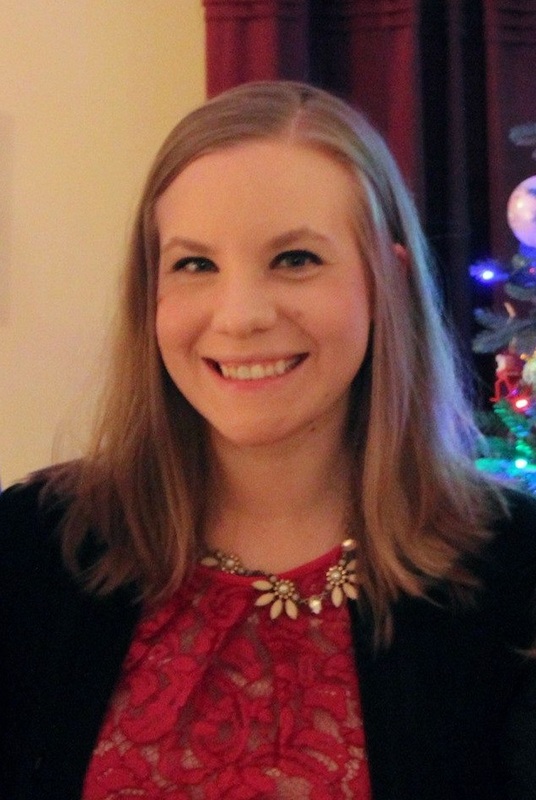 And a quick shout out to Jennie who designed my blog! I won her contest for a blog redesign for a while back and she was so wonderful to work with. Layer your front square, batting (I used batting scraps cut at 5 inches across and trimmed them once quilting was done), and your backing square together. Quilt as desired. (I quilted mine with straight lines approximately a quarter of an inch apart.) Trim off excess binding. Sew on binding as desired. Ta da! Maybe even put some cupcakes on your cupcake coasters. Thanks so much for stopping by and don't forget to visit Cathy over at Blueberry Patch! Since I got the binding done on my snowflake wall hanging, I got the binding cut and the front sewn on to my Seville quilt. I had juuuuuust enough of the green print to use it for the binding, which made me very glad. Here's a close up of a little bit of the quilting, I think that the maroon is very fun and different. I'm hoping to start the hand binding on this one this week, but it might not get done until I get back from visiting Park Ranger Boyfriend this weekend. Hopefully, it won't get put in a pile for as long as the snowflake quilt was sitting on the chair in my living room. Even though my mom and sister brought me my snowflake wall-hanging all machine quilted and I sewed the binding on the weekend they were here in JUNE, it took me until now to finish it. Let's see if I can get the sleeve sewn onto it before I put up my Christmas tree. I started working on the sashings for Park Ranger Boyfriend's Civil War quilt based on Barbara Brackman's blog series from last year. I got fabrics from her 1862 Battle Hymn line to use for the sashings and border. Unfortunately, I either didn't do the math or I didn't do the math correctly and didn't end up having enough of one of the sashing fabrics. So here are my three piles of blocks in various states of completion. For comparison, there are 56 total blocks, 42 with both sashings, 8 with one, and 6 with neither. If I would have cut 1.5" sashings instead of 2", I might have been OK. So in my frantic "I can't believe I didn't buy enough fabric" panic, I searched all of my stand-by online fabric retailers, and was disappointed by all. I guess this line has been out for a while and I didn't plan accordingly, but this definitely sent my panic into an uber panic. 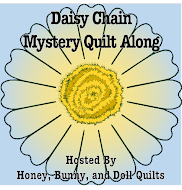 I did find it at a few smaller online boutique quilt and sewing shops, but with rather high shipping and higher per yard prices, my stomach twinged a little bit. As a last ditch effort I ended up looking for it on Etsy. Normally, I'm not much of an Etsy-believer (but those are stories for another day and time) but I did end up finding it for (what I consider) a great price and fair shipping. In my order, I wrote the seller a short note thanking them for having the fabric in my hour of need. One yard should be on its way to me very soon, which is more than enough for my project, but I have definitely learned my lesson. I'm breathing a huge sigh of relief that I can actually finish this project because for a while I was worried I was going to have to change my plans entirely. A little delay is a lot better than seam-ripping all of those sashed blocks apart. After 5 days of being home from my whirlwind trip out to Colorado for a friend's wedding, I am finally back in the sewing swing of things. It didn't help much that I took a red eye flight back on Monday morning and got back to my town at 9 AM. I went home and slept until 4 PM. This week and into this morning, I finished up my Nubees blocks for August. I really liked this pattern a lot when I found it on Quilter's Cache, but I did have some hesitations about picking a rather intricate block. The first time I tried to make the angled blocks that end up looking like chevrons, it was a complete disaster. But, of course, by the time I got the last ones done, I can churn them out rather quickly and much more accurately. Now I need to make one of my own! Since I did my marathon sewing, I haven't done a whole lot because Park Ranger Boyfriend came to visit and I had to clean up all of my sewing stuff so he could use the kitchen table for historical research for two days. I have since recluttered the table in starting to work on my August blocks for my Nubees swap. I have one block done, one block cut out, and two blocks that I am still working on figuring out which fabrics to use. I might have to go buy a quarter yard or so of grey. Not sure yet. In other blog news, my day on the Let's Get Aquainted blog hop is fast approaching! If you haven't been keeping up, you are missing out! My project that I've been working on is fast, easy, and you can use up scraps of batting. August 20th also marks the anniversary of starting this blog! (Blogiversary, if you will) So in honor of that and in conjunction with the blog hop and because I have almost 50 followers now (heck yes!) I'm going to do some sort of giveaway to celebrate. If you have ideas let me know! Also, Pile O' Fabric is hosting a new event: Pin it, Sew it! in order to get us all to actually make use of all of those sewing and crafting pins on Pinterest that we hoard. I know it's not just me! This weekend, little to no sewing will get done because I'm making a whirlwind trip to Colorado for a college friend's wedding! Hope you all have adventure filled weekends as well!